The Crested Shelduck is an elusive species of bird that belongs to the Anatidae family. Very little is actually known about the Crested Shelduck which is mostly down to very limited observations of the species and although currently listed as critically endangered many believe that the Crested Shelduck may be extinct. The only reason that the Crested Shelduck is not listed extinct is because of a handful of sightings over the years up until present day. The last confirmed report of the Crested Shelduck was in 1964 however since that time reported sightings of the Crested Shelduck among bird enthusiasts have continued spanning Korea, Eastern Russia and most recently in China. The Crested Shelduck can be identified by its distinct color and markings which are a mixture of brown, black, dark gray and dark green. The crown, breast, tail and primaries are of a deep green color in males with the remainder of the head and chin dark brown. The underside of the male Crested Shelduck is usually a shade of gray and its wings are a mixture of white and bright green. The female Crested Shelduck is mostly dark brown and visually less impressive than the male as is the case with many species of bird. Sporting white trimmings rather than gray the female is generally lighter than the male with not as much green coloration. Both the male and female Crested Shelduck have a green plume on their heads. The preferred habitat of the Crested Shelduck is believed to be that of wetlands and coastal areas, particularly in areas surrounding river mouths. The most up to date sightings of the Crested Shelduck place it in Chinese wetlands. 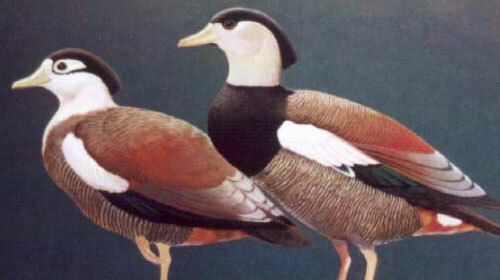 Previously specimens of the Crested Shelduck have been found across Russia and Korea and it is believed that they may breed throughout Eastern Russia, North Korea and Northeast China. The diet of the Crested Shelduck is thought to be primarily made up of a combination of sources such as; small invertebrates, algae, crops, carrion, aquatic vegetation and mollusks. The Crested Shelduck is believed to travel in groups of up to 10 and nest within tree cavities although this is not proven. There is a lack of information available on the Crested Shelduck however experts believe that the Crested Shelduck may be nocturnal with a breeding period stretching between May and July.